Another way that not only is jewelry beautifying our world but contributing to causes and making a difference. Read on. Last spring, Michelle Graff wrote an informative blog on the plight of the honeybee: how colonies are collapsing, hives are failing and bees are dying, as covered in a Swiss documentary called More than Honey. At the end of her blog, she highlighted two brands that were introducing bee-related jewelry designs, the sales of which would profit organizations working to understand and combat the factor contributing to bee colony collapse. One of these brands was Gumuchian, which debuted its “B” collection at last year’s Couture show. The B collection offers honeycomb-themed jewelry made in 18-karat gold with diamonds, and a proceeds of all sales from the line go to HoneyLove, which champions urban beekeeping and home gardens. Nothing excites us more than when jewelry-making and a good cause combine. In this case, the invasive lionfish which threatens to destroy the waters of Belize because of its and ability to procreate at a rapid pace and eat with abandon. Read on. The tail of the lionfish is considered waste among fishermen, as it is not edible. By using the tails of the lionfish for jewelry, each lionfish caught then gains 40 percent more monetary value. 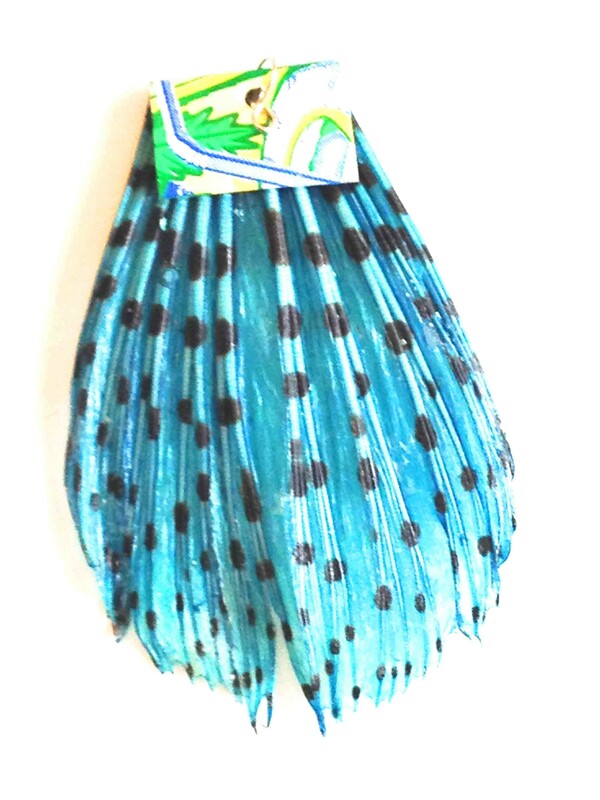 The upfront investment to produce jewelry requires a small amount of varnish to treat the lionfish tail and supplies for making the jewelry which gives the women a huge profit margin on each piece sold. Considering the marine life attracts so many tourists that visit Belize, the lionfish jewelry has a large market made up of people willing to pay a premium price. What a wonderful weekend in Arizona. When our jewelry meets a good cause, its a very fulfilling feeling. We were lucky enough to take part in this wonderful event as well as add a piece to the silent auction. The Wishes for Wildlife benefit is designed to answer the community’s need for quality wildlife rehabilitation, environmental education, and conservation services. Liberty Wildlife’s mission is to “nurture the nature” of Arizona. Founded in 1981, Liberty Wildlife has nurtured over 71,000 birds, mammals and reptiles. Together we can help thousands more as they struggle with urban encroachment into their native habitat and rapidly changing environment. Please join us in preserving our unique wildlife heritage for future generations. 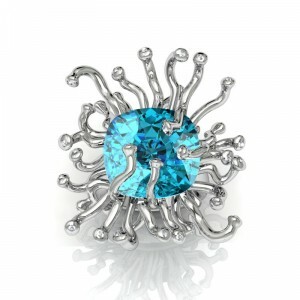 Below is our contribution to the Silent Auction portion of the benefit: a sea anemone ring with a blue topaz in the center. Below is a touching story of one woman who not only found therapeutic qualitites to jewelry making while in the hospital but realized the importance of paying it forward once she was released. Reading resident and Boston College Junior Rachel Marolda learned to make jewelry in 2006 while recuperating from brain surgery. She eventually made and sold enough jewelry to donate $10,000 to Children’s Hospital Boston, where she was treated. She will make her next $10,000 donation after the holidays. Marolda had her first brain surgery in 2006, when she was just 14-years-old, to remove a tumor that was sandwiched between her pituitary gland and optic nerve. She became restless while recuperating, so her mother suggested she make jewelry. With help from her mom, and teaching herself basic techniques, Marolda began making earrings, bracelets and necklaces. After recovering, she started working at a bead store in North Reading, Bett’s Bead Shoppe. Bett taught her new skills, how to perfect what she already knew about jewelry making, and paid her in beads. 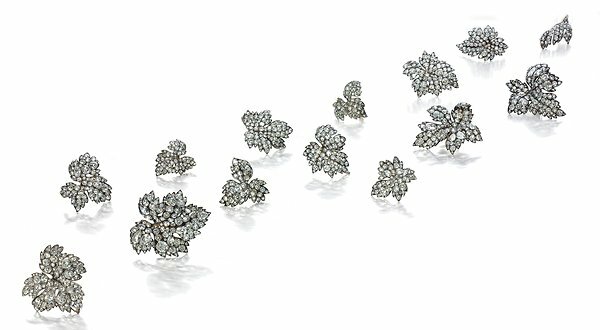 Lily Safra’s auction of her personal jewelry in Geneva in May includes this set of twelve antique diamond leaf brooches and a pair of ear clips from the mid-19th Century. The jewelry collection of famed philanthropist, Lily Safra, will be up for auction at Chrisite’s Geneva on Monday May 14, with all proceeds to be donated to 20 different charitable institutions. The collection includes the largest single-owner selection of jewels by JAR ever to be offered at auction. Regarded as a major philanthropist, Safra is also a discerning connoisseur. This jewelry collection reflects her refined taste and its evolution through five decades, from the 1970s to the present day. Featuring 70 lots, the sale at the Four Seasons Hotel des Bergues is estimated to fetch more than $20 million. It includes important diamonds, rubies and sapphires, as well as an outstanding array of fine antique and period jewelry. When Grace Freeman was eight months old, civil war forced her family, which included her mother and three siblings, to flee their native Liberia and resettle in a camp in Ghana that was home to some 47,000 refugees. Grace wanted to go to school but it wasn’t free and her family had no money to send her. So they struck up a deal with a local woman: Grace could live with her and go to school but, in return, would have to do all of the housework. The 7-year-old left her entire family behind in the refugee camp to move in with this woman who promised her an education. It wasn’t too long after, however, that Grace discovered she essentially had been sold into slavery. She never got to attend school and, instead, was awakened as early as 3 a.m. to do a list of chores that it would take a normal adult a week to complete. She was beaten regularly. One day 11 years later, an 18-year-old Grace was outside working her way through a pile of laundry when she heard a voice intoning her name, telling her, “Grace, go inside.” Though she knew she risked a beating by leaving her work, the internal guidance was too strong to ignore. She trusted her instincts and entered the house, only to find her United Nations identification card on the table, documents her captor had hidden years earlier in order to claim Grace was her daughter and keep her as a slave. Grace snatched up the documents and ran to a neighbor’s house, begging the neighbor to hide them for her until she escaped. This act of bravery resulted in a beating that almost ended Grace’s life. But it also marked a new beginning. The Strongheart Fellowship Program, a non-profit that gives young people who have been displaced or orphaned by conflict a safe place to heal, a chance to get an education and, hopefully, return to their communities to become leaders. As part of the program, all participants design a product or a service. Grace, along with fellow Strongheart Lovetta, chose to create a piece of jewelry that is part self-expression, part fund-raiser. For more information on becoming involved with The Strongheart Fellowship Program, contact Beth Anne at eab@elizabethannebonanno.com or call (646) 528-8299.